It’s been what you call a wet weekend. What this storm lacked in wind, it made up for in rain. Someone said that we got more than 16 inches in 12 hours. The picture below is the entrance to our neighborhood. Fortunately our house is situated on high ground and although we had plenty of leaks in the house, we didn’t experience flooding. Some of our friends did have flood damage, thousands of the poor that live in little huts lost all their worldly possessions, and the news said that 240+ lost their lives. Driving on streets like this is kind of risky. One of the main reasons is that many man hole covers are missing. People have borrowed them to use as doorstops or to sell as scrap metal. Normally, you just drive around the holes but when the streets are covered by chocolate brown water, you just have to hope you won’t put a tire in one of these or step into it when you are walking. Lots of folks were caught off guard and the many families had members that were stranded in one place or another. One of Carrie’s friends spent the night with us. Her parents were stuck in the upstairs of their house. The downstairs had five feet of water. Their car parked outside was almost completely under water. The waters subsided a bit on Monday morning and since we didn’t have a dove to throw out the window we decided to go out and see if we could be of any assistance. Before we got out the door, we got a call saying 20 people were needing a meal and drinking water down in the neighborhood that was badly flooded. This is only a 20 minute drive from our house. Heidi and Carrie started cooking and I took the boys to the grocery store to buy some needed supplies for the flood victims. 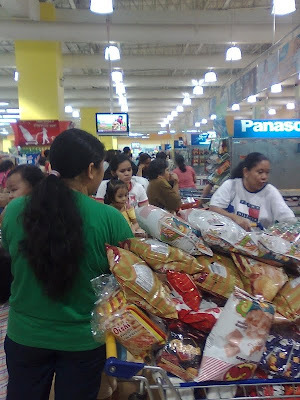 The picture below is of the lines in the store. I waited in line for almost an hour. We finally got everything in the van and headed for the needy area. When we arrived a few interesting things happened. First, we were told that a dam was too full and the neighborhood in which we had wormed our way into could be flooded again at any moment. This was not good news. We thought that maybe this was a untrue rumor, but had no way of knowing and were a bit anxious to keep moving. Second, the 20 people who needed the food had been evacuated. Third, there were 50 Filipinos who had been left homeless who were staying with a missionary family and had just run out of food. Fourth, the family that we had come for was ready to be evacuated. So, we gave the buckets of rice Heidi had cooked and all the bottled water and food I had purchased to the folks helping the Filipinos, loaded the couple we had come for in the van and worked our way to high ground without seeing any flood water. During the storm we lost electricity for 18 hours and stopped getting running water (not including what was running down the walls and through the ceiling). I was able to get a gas lamp going so we had some light in the evening. After three days, we still don’t have running water, but we do have a source of clean drinking water that we can get to, so we are doing fine. I expect that we will be helping folks with clean up for the next few days. Next time we’ll try to be more prepared. I’m already making a list: flashlight, drinking water, and a dove. This was a good blog entry...the pictures confirmed what our minds had imagined things would look like. (Does that make sense?) So thankful your family is safe and sound, and we're thinking a lot of all you over there in Manila. We heard some more rain may be on the way this weekend. Praying!! !